Concerns about our environment has grown in recent years as well as the worry of the negative effects the construction industry may have on the health of our air and water. In fact, new construction, major rehabilitation and thin hot mix asphalt (HMA) overlays have the highest energy use. However, a recent paper, Energy Usage and Greenhouse Gas Emissions of Pavement Preservation Processes for Asphalt Concrete Pavements by J. Chehovits & L. Galehouse, concluded that asphalt pavement preservation techniques can significantly reduce energy and greenhouse gas (GHG) emissions. Asphalt preservation treatment reduces damaging effects of aging and deterioration of a pavement surface layer. Treatment also protects the underlying pavement structure and extends the remaining service life of your asphalt. Without proactive preservation, asphalt pavement declines more quickly and requires major rehabilitation with structural overlays or reconstruction much earlier. Chip seals, slurry seals, micro-surfacing and crack filling utilize reduced levels of energy per year of extended pavement life. 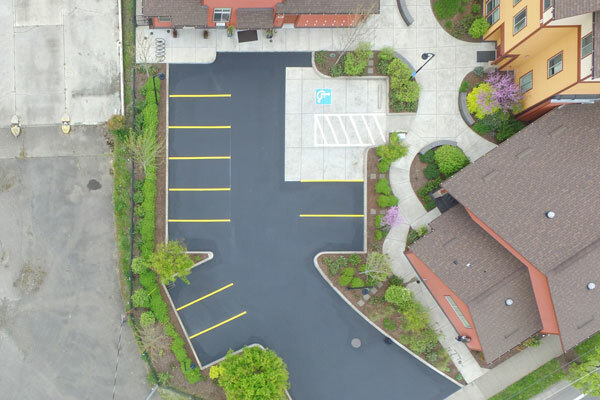 Crack seal and asphalt sealcoat use the least amount of energy per year of extended pavement life at less than one percent the emission of replacement. Crack sealing prevents water from entering and destroying pavement and also helps to significantly reduce energy, waste and pollution over “remove and replace” repair methods. Our professionals utilize sustainable practices throughout our asphalt services in Eugene, Roseburg and Coos Bay. Contact Aegis to learn more.